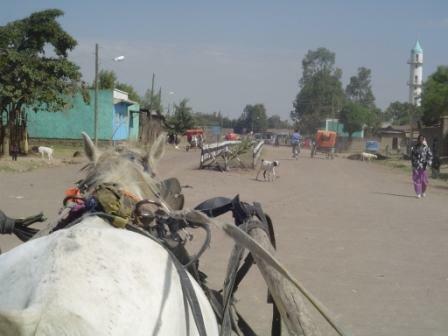 We landed in Addis Ababa and were greeted by our numerous Ethiopian “children.” As part of the rush of greeting and reporting, our Alaba son David told us how the Lord had already gone before us. 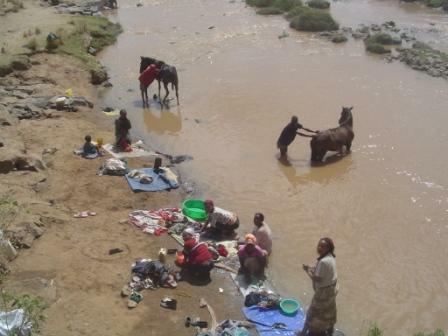 If you had been watching the news, you knew that Ethiopia and Somalia had been on the brink of war for several months. In fact, as we boarded the plan in Washington DC, headed for Germany, the front page in the newspaper read, “Somalia declares Jihad on Ethiopia.” What the article didn’t say is that the extreme fundamentalist elements of the religion of Islam had been doing terrorist training (Al Qaeda style) in the Alaba region. 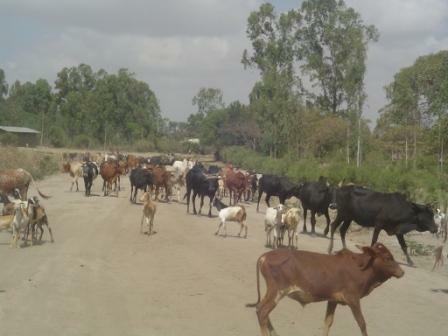 The instant Somali forces crossed into Ethiopia, they were poised to cause disruption. But the Ethiopian government had undercover spies in Alaba, and just 2 weeks before we arrived they did a sweep, arresting dozens of top terrorist leaders. As David joyfully reported, “So we have peace now, with soldiers everywhere!” In the providence of our loving God, the Ethiopian forces entered Somalia while we were out in the rural villages, and within a matter of days, God gave them complete victory. The fundamentalist Somali leaders and their army were cornered between Kenyan forces on the Kenya border, Ethiopian soldiers, and the US Navy standing off Somalia in the Indian Ocean. We have never been afraid of possible harm; our Lord knows what He is doing, and He is fully able to keep that which we’ve committed to Him (our souls and our lives). Most of the time we are blissfully ignorant of His actions on our behalf. But sometimes He gives us a little peek. This was one of those peeks, and we praise His Name for being the All-Sufficient One. About 2 years ago a young Muslim man murdered a young Christian man in a village in Alaba. A judge sentenced him to 12 years in prison. In revenge actions taken by the Muslim relatives of the murdered man, the two brothers of the victim were accused and also imprisoned. Family rose against family; fear permeated relationships as accusations raged and homes were burned. Into this situation, 18 months ago, Dave visited Alaba for the first time. He wanted to meet the parents of the murdered man and pray with them. While returning from their village, he saw lights in the distance…it was the prison. The next day he went to visit Mohammed the prisoner. He explained the purpose of Christ’s life; he told of forgiveness in the blood of Jesus; he spoke of a love that knows no bounds. Mohammed wept upon hearing this good news; but the weight of warring families was upon his young shoulders. Dave gave him a thick blanket to keep out the cold of the rainy season. Here in our home in Virginia we began to pray nightly for Mohammed the prisoner, pleading with our Lord to open his eyes and bring him into His family. On our next visit, exactly one year ago, Mohammed accepted a Bible from us. We also gave him clothes. The church leaders were visiting him; the godly women in the church were cooking meals for him. Love was reigning, Christ’s love in all its glory. We continued to pray. Church people and leaders continued to visit and love. And then it happened. At about 4:30pm Monday afternoon, on our first day in Alaba, we visited Mohammed and the one remaining brother in prison. We took them clothes and we talked with them. And out of the clear blue Mohammed said, “I’m ready.” Ready? For what? For a long time he had been quietly considering Christ and His love. He knew all too well the cost he would pay for “changing sides.” Already his family had told him in no uncertain terms: “If you accept Christianity you will no longer be a part of us. We will not come to care for you when you are sick, and we will not attend your burial when you die.” Already isolated in prison, he would be totally alone if his family rejected him. Could the love of Christ keep him? On Monday afternoon, December 18, 2006, he decided to take the plunge. Surrounded by Dave, myself, and our son David, Mohammed raised both his hands to heaven and repeated the declaration of trust in Jesus as Saviour and Lord. Dave welcomed him into the family of God; we celebrated with hugs and tears of joy. “You are my parents. You’ve showed me love,” he kept saying. Then we returned to Alaba Town, and Mohammed returned to his prison comrades, 99 percent of whom are Muslims. We began our teaching ministry, but a few days later we returned to check on our new son in the faith. What did we find? We found a young man who was absolutely radiant with joy and confidence; he was at peace with himself and his God. How was it going with the other Muslims? “Yes, they want me to come back. But I’m not afraid of anyone!” The church leaders have arranged for frequent discipling with Mohammed. By God’s continuing grace, Mohammed will be strong in the faith when he’s released from prison. And who knows what great things our Lord will do with his young life. Mohammed’s embracing of Jesus’ love isn’t the only “success” story in this prison. The other brother, standing by and witnessing Mohammed’s raised arms and declaration of trust, knowing the price he was paying, decided to rededicate himself to the Master. The next day Kedir’s only pair of pants were stolen off the clothes line; he came to meet Dave wrapped in a bed sheet. And he was suffering tremendously with resistant malaria and typhoid; the prison would only pay for the cheap non-effective medicine. We were allowed to pay for his testing and medicines. 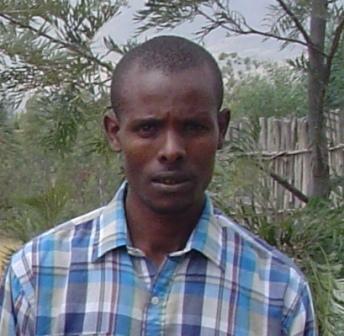 Pray for Kedir; like all of us who have wandered from the Saviour, his heart is sore with the misery he’s brought. Pray for him to stand strong in the blood of the Lord Jesus, a blood thick enough to cover ANY sin! He must daily call the Enemy’s lies what they are…lies…and he must live in the reality of Jesus’ forgiveness, just as Peter lived in that reality 2000 years ago. But the story doesn’t stop with Mohammed and Kedir. There are the guards. On our first visit, we were searched with suspicion; they definitely did not want us visiting. But by the second and third visits these guards were not only freely allowing us entrance, they were asking Dave to sketch their portraits, inviting us to coffee with them, letting Mohammed and Kedir outside the prison to visit with us and the guards. And when we saw these guards in town, they greeted us like long-lost family members! We don’t know where these guards are spiritually yet. All we know at this point is that God has opened wide the door of the prison. Wouldn’t it be wonderful if the Spirit of God swept through that prison, using Kedir and Mohammed? Jesus has turned these former enemies into brothers; He has replaced anger and aggression with His love and gentleness. In the confines of the prison, the others are watching. Changed lives are a testimony to power. In my interviews, I cannot tell you how many people said they came to Christ because they could not resist the testimony of changed lives. The church leaders are following up with discipleship training. And we plan to keep in regular contact, sending care packages, letters, etc., to both prisoners and guards. Please pray for this little plot of land where the air is so thick with heartache. Pray that the Lord will sweep the area with His love, so that many, many more will come to Him as Saviour and Lord. Like Paul in the book of Acts, we’ve met people in the normal course of life who seem to be divinely appointed. One such person is Haile the barber. 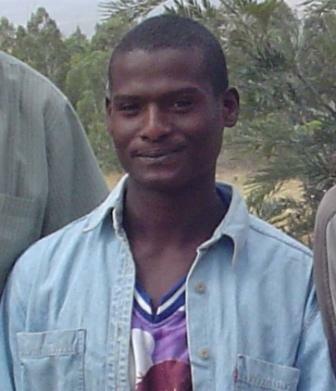 Haile is regularly visited by our son David and many other believers. They have been reaching out to him, touching him with the Saviour. 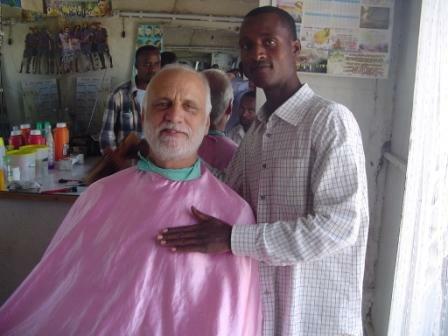 Last year Dave visited Haile’s shop on several occasions…not so much for the hair cut as for the relationship. Amazingly, just before our departure here we received an email from Haile. He was eagerly awaiting our arrival. On our first day in Alaba we visited his shop but he wasn’t there. We went on down the road. Word must have been sent to him, because some time later we saw Haile running down the dusty road, shouting with joy upon seeing us. What a happy reunion! He showed us pictures of his new bride; I gave him a jar of my strawberry jam and a kitchen towel. Haile was raised Orthodox. This religion is the foundational religion of Ethiopian culture. Many have said, “To be Ethiopian is to be Orthodox.” It dates to the fourth century, and probably at one time it reflected the true, simple Gospel of faith in Jesus’ blood alone. But in the 1600 years since its arrival in Ethiopia, the Orthodox Church has departed from the Scriptures. Today it is a mixture of Old Testament law, New Testament Gospel, superstition, traditional teachings, complicated rituals, and political conniving. The Orthodox Church leadership hates the evangelical churches and has fought the missionary movement from Day One. The persecution by the Orthodox Church of evangelicals equals that of any Muslim group. But God is working in the lives of people in the Orthodox Church. One by one, despite the pressures of their priests, disappointed and empty people are searching outside this organized, complicated religious system for some sense of spiritual satisfaction. One such person is Haile. He’s beginning to attend an evangelical church. He said to me, “There is much love here,” referring to the Alaba Town church. 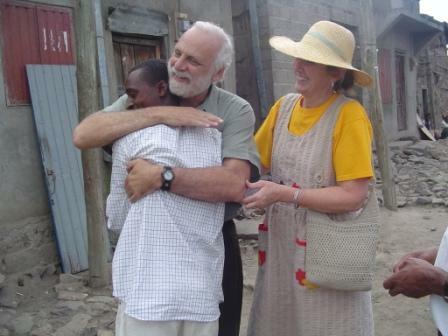 Every month Haile touches the lives of hundreds of people, over and over again, on the main street of dusty Alaba. What our Lord couldn’t do if Haile’s life was changed into one of true spiritual satisfaction and power! Imagine the discussions week after week with his captive audience in the barber chair. With the prevalence of HIV/AIDS, men are very careful about whom they choose as their barber. Haile is trusted. If our Lord redeems him, men will continue to come to him…they will hear of the Saviour as well as get a good, safe shave. Please pray for Haile. We did not expect the Lord to cause this relationship to blossom. As we were packing up our last items and loading the van to leave Alaba, Haile showed up. It was truly an honor for us, that he would leave his shop to come say goodbye. We will keep in touch by email, but mostly we just need to pray. Our Lord can do with Haile what He has already done with Mohammed the prisoner and with you and me. And so the glory of His love continues…..